I was jogging the other day and passed a guy that was working on his car. Naturally, I slowed down to take a look at his tools. The Handle was Green and Black and I never saw those tools before. I asked the man about them and he even let me try them on his car! Turns out that the tools were made by Wera – a company from Wuppertal in Germany. As you know when it comes to quality it is hard to beat German tools but they do come with a higher price tag than usual. Instead of taking a whole bag of tools you bring only your Kraftform set with you. A handle into which blades with a range of different profiles can be inserted. On top of that, you can even use the tip in power tools. 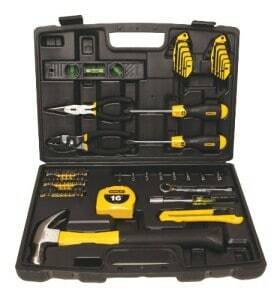 This set replaces a 6-piece screwdriver set and reduces the equipment required to a minimum. The profile and size of the bits are easy to recognize thanks to the Wera “Take it easy” Tool Finder with its color coding and clearly visible imprint. Since you can get all the different bits they make you can customize your screwdriver according to your needs. Make sure the bits are 1/4″ hexagon head drive if you want to use other than the original ones. A 2 position telescopic blade can be retracted into the handle for confined space operation or extended for more reach. It can also be removed and used as a 100mm bit holder in the power tool. Six bits are conveniently integrated into a push-button opening bit magazine. The Rapidaptor technology ensures rapid one hand bit changes, press-in auto bit lock, and a secure positioning when used in power tools thanks to the free-turning sleeve. When the unique telescopic blade is lowered into the handle, fast, easy screw-driving action is possible, even in the tightest spots. By pushing the clamping sleeve, the telescopic blade can be extended out of the handle and the compact tool becomes a full-sized screwdriver. If the clamping sleeve is pushed again the telescopic blade can be taken out of the handle, and be used as a machine bit adaptor. Lets talk about the handle first. The design of the Kraftform handle fits perfectly into the hand and prevents hand injuries such as blisters and calluses if you use it a lot. The hard materials used for the handle ensure rapid hand repositioning without any danger of the skin “sticking” to the handle. The surrounding hard zones with a large diameter allow your hand to glide almost like wheels in your hand. The large contact area – with particularly high friction to the soft zones – results in high torque transfer without any bruising from the edges. The stainless steel tools from Wera are vacuum ice-hardened. This gives them the hardness needed for screw connections. But the tooltip is really special. They use a precisely-focused laser that creates a sharp-edged surface structure. This laser treatment results in an edge hardness of up to 1000 HV 0.3. That is really hard. The Lasertip “bites” itself into the screw head and prevents any slips out of the recess. It is available for screwdrivers for slotted, Phillips and Pozidriv screws. The Wera Lasertip reduces the contact pressure required and enhances force transfer – meaning less screw-driving effort is required. Remember how sometimes screws sit tight and you have to press the screwdriver hard into the screw and still, it keeps slipping? I noticed the difference with this laser treated screwdrivers. The Wera “Take it easy” Tool Finder allocates bits a specific profile by means of coloured sleeves. An additional size stamp allows for differentiation within the profile. This means that the right bit can be found even more quickly and easily. Take it easy toolfinder: Output colour coding and large stamp to enable the desired bit to be easily located. A pouch that you can also attach to your belt.